2013/2014 Courses Include: Azalea Sands, Brierwood, Brick Landing, Crow Creek, Cypress Bay, Eagles Nest, Lions Paw, Lockwood Folly, Magnolia Greens, Panthers Run, Possum Trot, Sandpiper Bay, Valley at Eastport, Wedgefield. 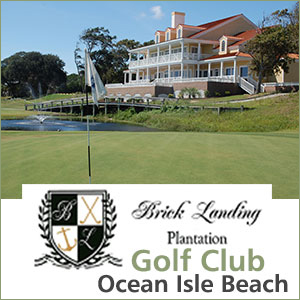 2013 Courses included: Azalea Sands, Brierwood, Brick Landing, Carolina Shores, Cypress Bay, Palmetto Greens, Valley at Eastport, Wedgefield. After 12:00: Brunswick Plantation, Lockwood Folly. Rates based on 4 golfers in a 2 bedroom/2 bath suite, 8 golfers if a 4 bedroom/4 bath Resort House or 2 golfers in a one bedroom/one bath Camilla Guest Room. 2014 Courses Included: Azalea Sands, Brick Landing, Brierwood, Brunswick Plantation, Carolina Shores, Crown Park, Cypress Bay, Eagles Nest, Lockwood Folly, Magnolia Greens, Palmetto Greens, Possum Trot, The Pearl, Sandpiper Bay, Sea Trail Byrd & Maples, Valley at Eastport.